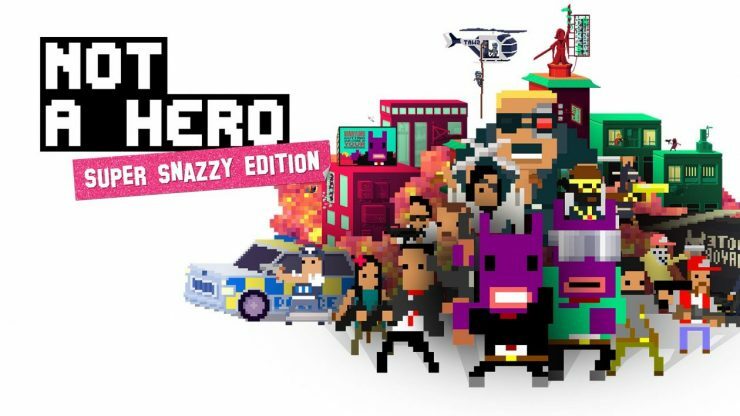 If your sense of humor is dark and irreverent, you need to check out NOT A HERO: SUPER SNAZZY EDITION, a 2¼D action platformer on Switch. Meet Bunnylord, a rabbit-human from the future running for mayor in a city overrun by crime. 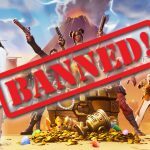 Bunnylord’s campaign strategy? Kill all the criminals and eliminate their drug rings in the city’s three main districts. To accomplish this (and appear “breathtaking” to voters), he hires a campaign manager, Steve, who’s also a professional assassin with a penchant for cleaning house. Steve is the default playable character, but more characters are unlocked as Bunnylord’s approval rating grows. 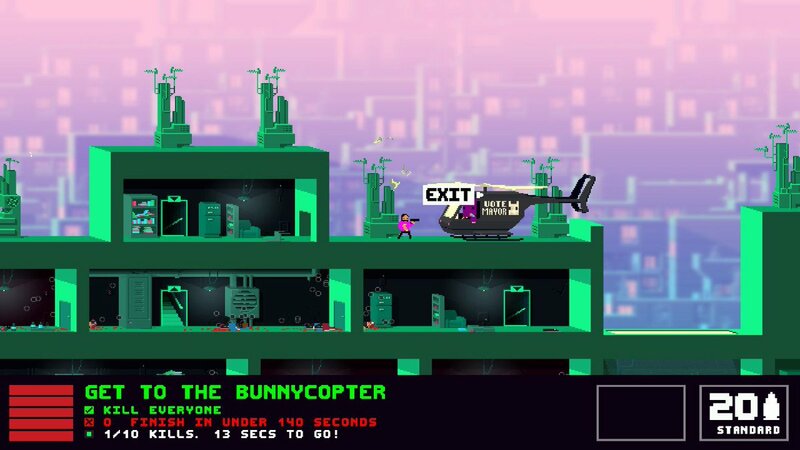 Help Bunnylord become mayor in a city overridden by crime! 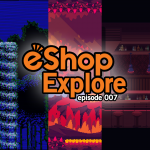 To raise Bunnylord’s approval rating, you’ll complete a variety of missions. 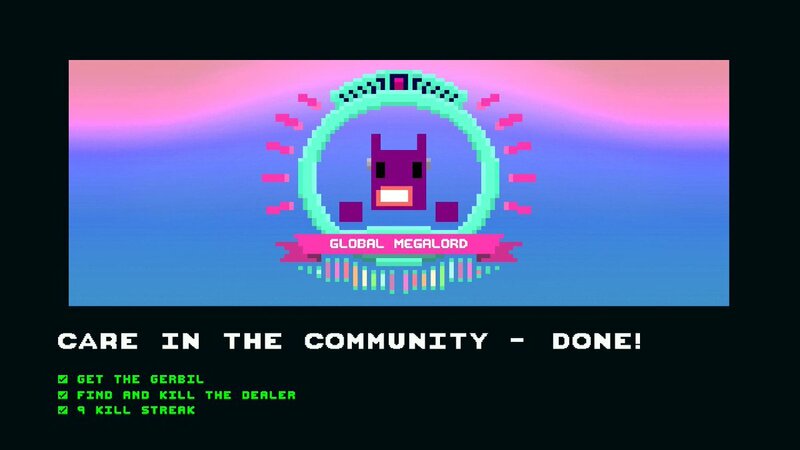 Missions always begin in Bunnylord’s Briefing Room, where Bunnylord explains your objective and how he’ll reward your success. (Perhaps he’ll buy you a milkshake, or maybe “an adequate breakfast.”) Then, you’ll move to the Bunny Fan Club Room, where all the assassins hang out. (At first, you’ll just find Steve in there by himself.) Finally, you’ll begin the mission and work towards your objective. Perhaps a billboard needs lighting, or some cakes need stealing, or a bomb needs planting. Missions also offer 3 challenges, like destroying ganja, rescuing a panda, or killing 4 people in 5 seconds. Remember that beating challenges and missions raises Bunnylord’s approval rating, which unlocks new playable characters. At first, you’ll just find Steve in here, but gradually, the gang will grow. Missions are set in the heart of the city, in multi-leveled, industrial buildings. You can climb up and down stairs, run along hallways, and shoot anything that moves. Sometimes, you’ll need to stand still for a moment to reload your weapon and take cover. You can also take cover by sliding across the floor, which also offers a chance to trip your enemies or slip out of a window (on purpose) to land on another building. Just try not to have too much fun, and remember that your main goal is achieving your objective. 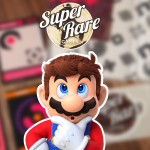 The game keeps track of your accomplishments, including the character(s) you’ve used to beat each mission—so for an ultimate challenge, try beating each level with every playable character to 100% the game! Missions are set in multi-leveled city buildings. Early missions are short and simple, but later missions are intricate, requiring you to learn their complexities in order to succeed. But as your missions grow harder, your arsenal stays the same. You’ll always have a gun, such as a pistol or a shotgun, which is determined by your choice of character. Your character might also carry a secondary weapon—like bombs, grenades, or turrets—but this isn’t typical, so you’ll generally need to search for sub-weapons or hope they drop from fallen foes. Sometimes, you can also find special bullets. Some offer special effects, like explosions, while others provide perks, like cutting the time to reload in half. Some characters come equipped with a secondary weapon, but most do not. In other words, NOT A HERO manages to twist what could have been a simple 2D platformer into something with a bit more dimension. And when you combine this 2¼D style with retro-inspired designs featuring bright, popping colors, you’ve got a recipe for sweet, sweet eye candy. Get ready to consume some sweet, sweet eye candy. NOT A HERO: SUPER SNAZZY EDITION is the ultimate indie for anyone looking for a run-and-gun shooter filled with hilariously irreverent antics. The game is great for speedrunning and offers plenty of replayability, with challenges to beat, characters to unlock, and an approval rating to raise. This SUPER SNAZZY EDITION is also available on Xbox One and PC, so don’t think this Switch port is your only option. 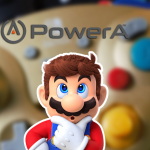 But remember that the Switch port is the only portable port, allowing you to play anywhere—even in the staircase of a skyscraper, the hallway of a warehouse, or even the office of a mayoral candidate! Pick up your Switch any time and play a level or two, or try to learn a mission’s ins-and-outs so that you can progress more quickly. 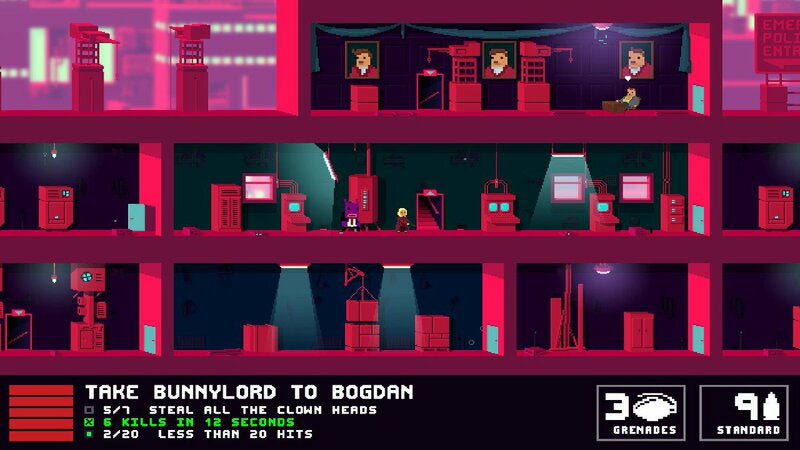 Just keep in mind that the violence, language, and dark humor in NOT A HERO is NOT FOR KIDDOS, so we advise keeping this game away from children. If you’re 18+ with a dark sense of humor, give NOT A HERO: SUPER SNAZZY EDITION a shot today!